In this blog post, I am going to let you know that how to Monetise YouTube video or how to make money from YouTube? 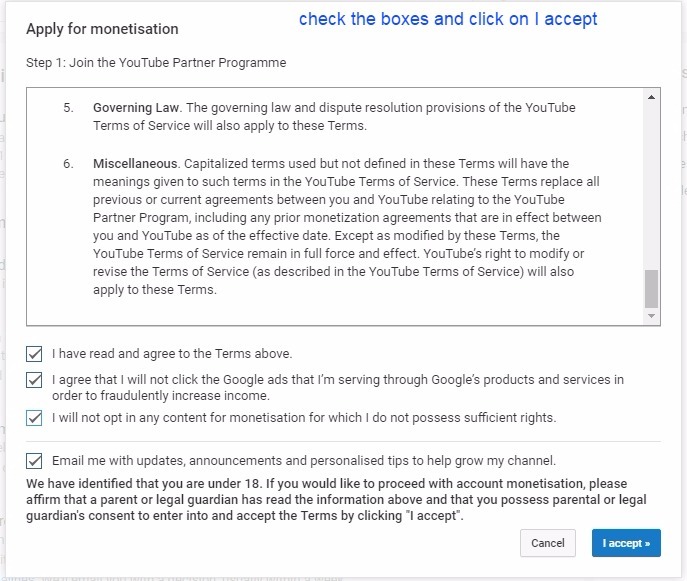 What is this Monetisation process? When you want to make money from your YouTube video then you need to monetize your video for the same. So it is a simple process to connect your video with Google Adsense in order to make money. What is the procedure to monetize Youtube video? Before monetizing just upload a video to your channel. Login to your channel. click as shown in the below image to upload your video. 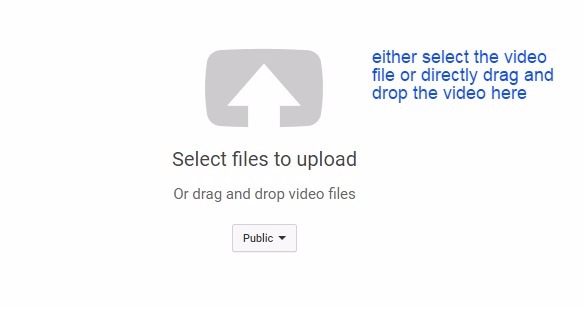 Here either select the file to upload from concerning folder or drag and drop the same file here. See the image below. your video and also can add the description for your video. When you are done with all the three kinds of setting like basic, translation and advance, make all the ncessary setting and make them save, then you can finally click on the publish button. See the image below for the same. Here you get the sharing link for your video which you can share with several social media platform. You can just go to your video manager option given below at right for further setting and to see your dashboard. This is your channel dashboard. You can manage almost everything here. For monetizing your video click on the channel. 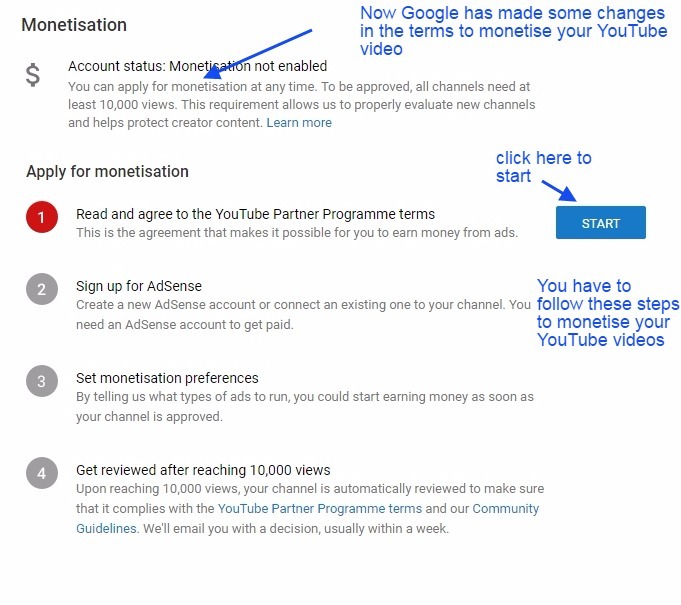 Here you can see the option for monetization. Initially, for new users these enable option might not be there then you just click the link with a message and set your country and click on save then again click on a channel, this time you will get this enable option with Monetisation. See the image below for the same. 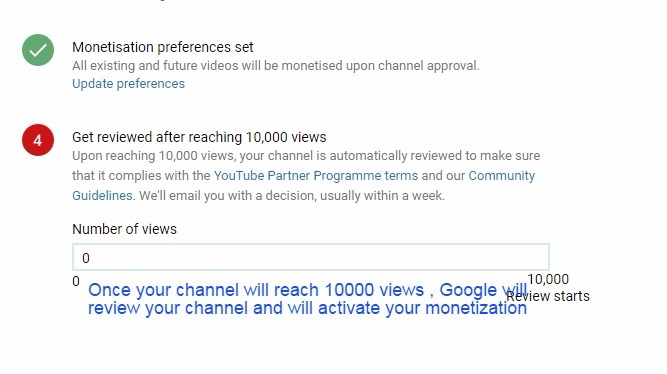 Few month back, Google made this rule that your channel must get first 10000 views for getting a review for monetization. So those who already made their channel with monetization before this rule, they will get the money for their video views. spammers to dispose of the bad content. 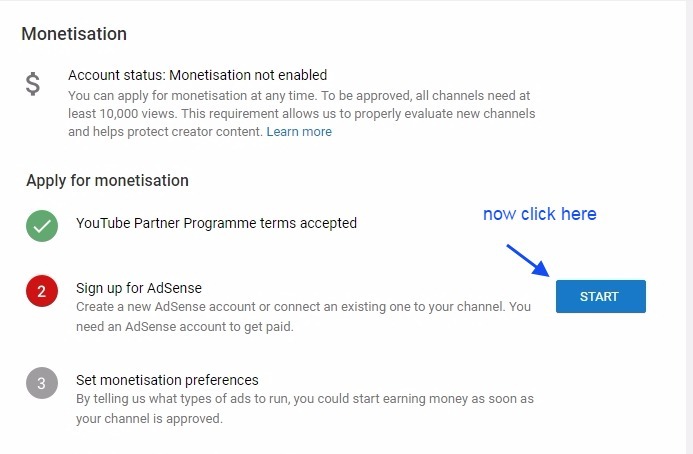 For Monetizing your channel you need to complete these simple steps one by one which hardly requires some clicks or checks box filling for confirmation. See the image below for the same. Here read the terms and condition and click the check box. See the image below for the same. 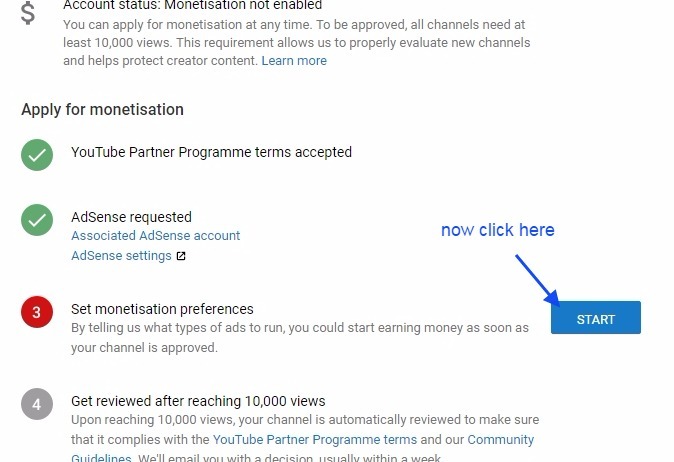 Here you connect with a new Adsense account or you can also connect with existing Adsense account if you have any. It is very simple to connect with a new Adsense account, It only requires a Google account. See the image below for the same. Here we are connecting this with an existing Adsense account. 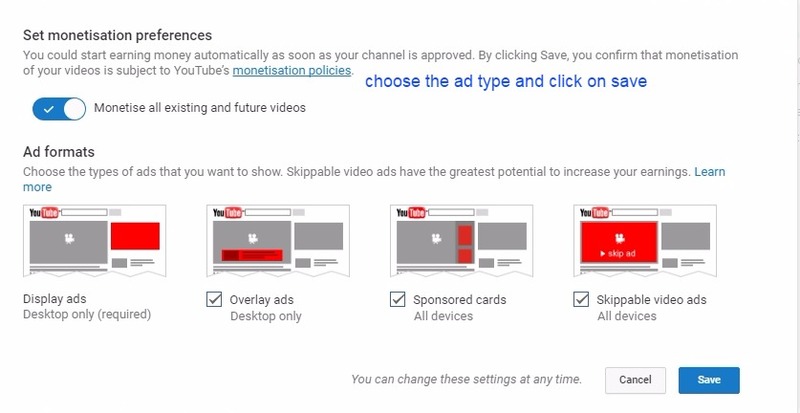 Here you need to make some Ad preferences for monetization. click the option as shown in the below image. 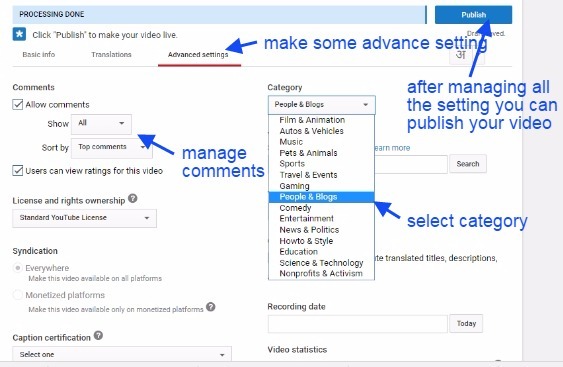 Make this setting ON which will monetize all current and future video, once your account will approve for monetization. All setting are done, Now upload the best quality video according to your niche and increase your view ASAP. Once your view will reach 10000 then your monetization will be activating after a formal review by Google. What if we uploaded a video which has copyright content? It is not a big problem, If you will upload such material then you will receive an email from YouTuble regarding this copyright content. There might be two cases. You can keep this video in your channel but the profit of this video will be sent to the original owner of this video who has rights for this video. So, finally, it is your wish to keep or remove this video from your channel. This is the case of shared profit: For example, you uploaded a video which may have copyright audio or visual, in this case, the copyright owner of that audio or visual can offer you a deal of sharing profit as you both have content in the video. So this is up to you that you want to share a profit with the video or you would like to update the concerning copyright audio or video into your uploaded video. How Youtube track that I have used some copyright material in my video? When you upload a video then first it gets uploaded and then processing. So during this processing, your video is tracked within it’s audio and visual frame by frame. And is easily identified that you have used some copyright material. And when you monetize this video then you got an email regarding this copyright content.